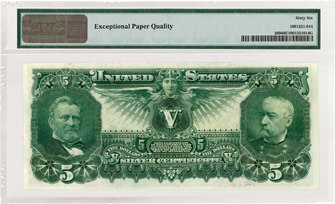 The $5 Educational note picture was issued in three different signature combinations between 1896 and 1898, catalogued as Fr#268–270. It features a composition by painter Walter Shirlaw who was commissioned by the Bureau of Engraving and Printing (BEP) to create the image of “Electricity Presenting Light to the World.” The engraving was then masterfully executed by US Treasury engraver George F. C. Smillie. 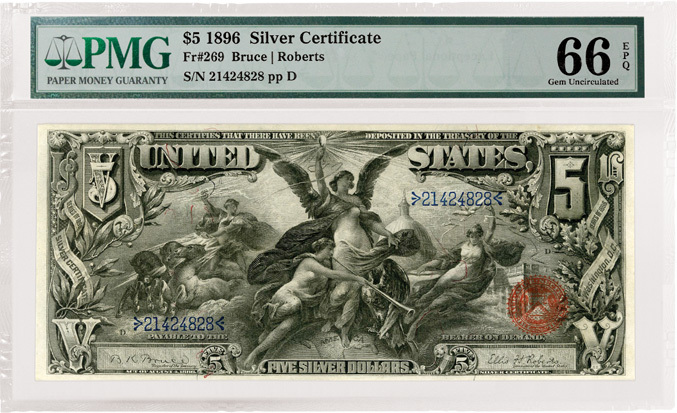 Today, many collectors consider this note to be the greatest artistic achievement of the BEP. In 1896, however, the note was the cause of some controversy. The naked breasts featured on the note caused society ladies in Boston to take offense leading some bankers to refuse to accept the notes in transactions. This is where the phrase “banned in Boston” came from. 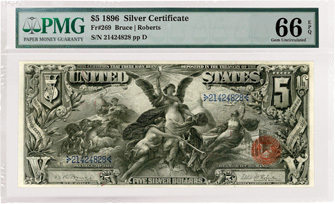 The BEP prepared a redesign of the notes with the bosoms draped for the 1897 series but it was never implemented. According to the PMG Population Report, as of July, 2012, PMG has graded 350 of the Fr#268 notes, 211 FR#269 notes and 125 Fr#270 notes. 18 examples of the Fr#269 notes have graded at the same level as this note (Gem Uncirculated 66 EPQ) and higher.